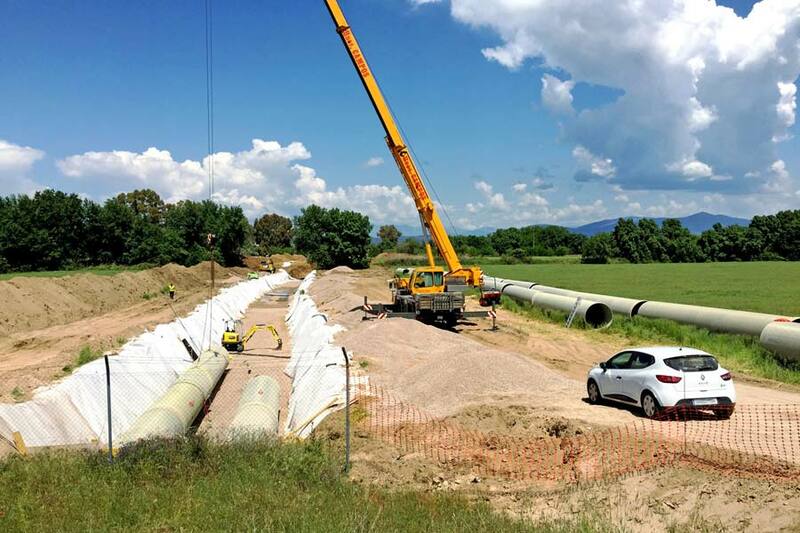 Amiblu supplied 7500 m Flowtite pipes DN 1600 for a new irrigation system in the Spanish province of Toledo. The GRP lines transport raw water uphill from the Tagus river to the Lower Channel of Alberche. With a length of more than 1000 km, the Tagus River (Spanish: Tajo) is the longest river of the Iberian Peninsula. The major part of it (716 km) flows through Spain, and it empties into the Atlantic Ocean near Lisbon. The Tagus drains an area of 80 100 km² and is highly utilized: Several dams and diversions supply drinking water to central Spain and Portugal, while dozens of hydropower plants create electricity. In January 2017, the Confederación Hidrografica Del Tajo issued a tender for the project “Elevation from Tagus River to the Lower Channel of Alberche”. The project involved building a new pumping system which should replace the provisional emergency system for supplying raw water from the Tagus River to the Lower Channel of Alberche in case of tense hydrological situations such as droughts. The construction company Construcciones Alpi, who won the tender, chose Amiblu as supplier of the required GRP pipes and fittings to successfully implement the project. The planned system should start at the right bank of the Tagus River, 500 meters downstream from the source of the Las Parras stream, and transport water with a maximum flow of 7 m³/s uphill to the Lower Channel of Alberche. This way, the concerned area can be reliably irrigated at all times without depending on the existing provisional facilities that also supply the municipality of Talavera de la Reina (Toledo). To realize the elevation, Amiblu supplied 7.5 km of GRP pipes DN 1600 as well as multiple elbows and drains. The new system consists of two parallel pipelines with 3750 meters length each and runs along the municipality of Talavera de la Reina. In accordance with national regulations, two main roads and one rail track intersecting with the route were crossed with concrete pipes, which were installed via jacking, and into which steel pipe sections were subsequently inserted. The steel and GRP pipes were then joined with a leak-proof flange connection. The new system also features six pumping stations that are successively arranged at different heights over the entire route, each of them able to exceed 18 meters of geometric height up to the final target, the lower course of the Channel of Alberche. The province Toledo is now well-equipped for future periods of drought.